The NBA season is almost here and new shoe releases are right around the corner. The Crossover jumps into all of the biggest sneaker storylines. The NBA season begins in two weeks and that means there are a bunch of sneaker storylines to dissect. LeBron James is a Laker and will continue to dominate headlines after releasing his most innovative sneaker yet in 2017, the LeBron 15. New signature sneakers will be unveiled in the coming months and new shoe stars will emerge. The NBA relaxed its sneaker colorway rule and Puma is back in the basketball business. Here is The Crossover’s NBA sneaker preview for the 2018–19 season. Can Kyrie end LeBron’s sneaker reign? LeBron James has been the king of the basketball sneaker market for some time. According to Forbes, James remained the NBA’s top shoe seller in 2017 but saw his shoes declined in sales. In fact, only one player out of the top-5 pitchmen had surging shoe sales: Kyrie Irving. Irving’s move to Boston paid huge dividends for the five-time All-Star. 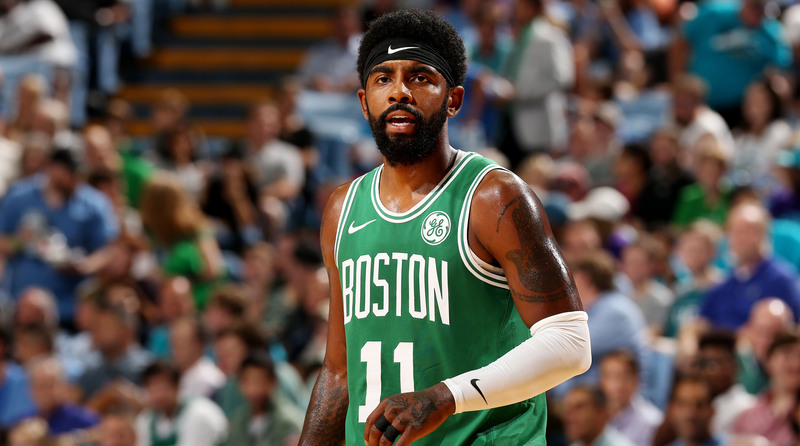 Kids are obsessed with Kyrie because he is an exciting player they can relate to on the court. It also helps that he has built a marketing machine with his Uncle Drew character. Kyrie’s signature line is off to one of the most impressive starts in basketball, as each sneaker has been a hit with his NBA peers on the court. LeBron and Kyrie both received major pushes from Nike with both players showcasing their creativity in different ways. James took over fashion runways and introduced collabs with Kith and John Elliot and Co., while Irving partnered with General Mills on a Kyrie 4 sneaker package that instantly sold out. Kyrie has proven that he is a superstar on and off the court, and LeBron’s star power will evolve even more in Los Angeles. Laker fans will buy LeBron products in bunches. Kyrie will have to settle for being the No. 2 guy again for now. Who are the best sneaker prospects in the NBA? 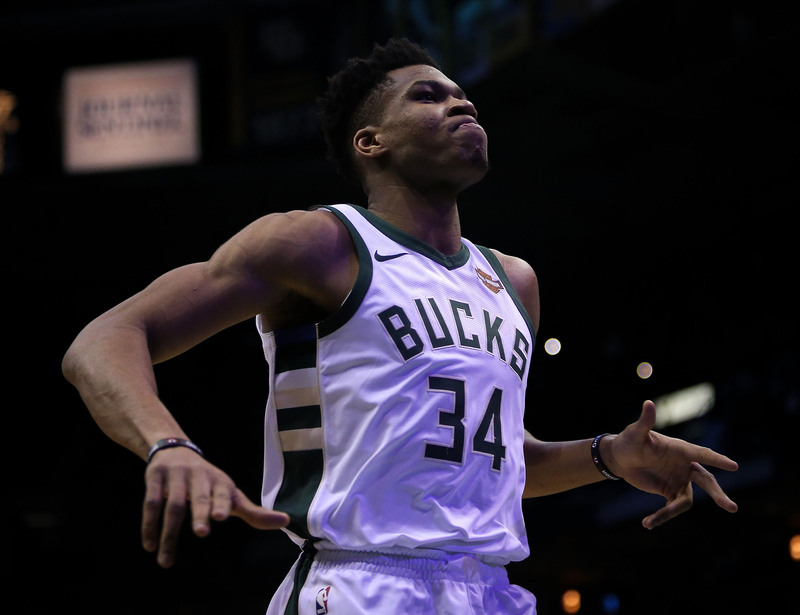 Giannis Antetokounmpo: The Bucks star will receive the first signature shoe from Nike since Paul George was rewarded for his service two years ago. So who is next in line? Nike has three solid prospects you can make a case for, and that list starts with Anthony Davis, who signed with the Swoosh out of Kentucky and has been there since 2012. Davis is building a campaign to be the best player alive... but would his shoe sell well in this era? By 2020, Davis could be the best player without his own signature sneaker. Ben Simmons: All the tools for a signature sneaker star are there. He carries himself like a 10-year vet, and under the mentorship of Rich Paul and LeBron James at Klutch, he will have no problem securing business opportunities. But will his lack of a jumpshot hurt his marketability with kids? If Simmons can lead the Sixers to the NBA Finals within the next two seasons, a sneaker might be on the horizon for him. The King of the East title is still up for grabs. Which Players Will Benefit Most from NBA's Sneaker Colorway Rule? Jayson Tatum: He has a few years to go until he is an established star, and it will take some time before he gets a signature shoe. His path may follow Paul George or Antetokounmpo, who both had to wait years before the Swoosh granted them with signatures. Mamba 2.0 has the skills but will need to make sure he isn't overshadowed by the loaded roster in Boston. Donovan Mitchell: Due to the space at Adidas, Mitchell might have the best shot at securing a signature sneaker out of this bunch. James Harden, Damian Lillard and Derrick Rose are the lone sneaker stars for the brand and Mitchell’s popularity skyrocketed after his brilliant rookie campaign. Mitchell has the game, the charisma and the nickname to be a star in the league for a long time. 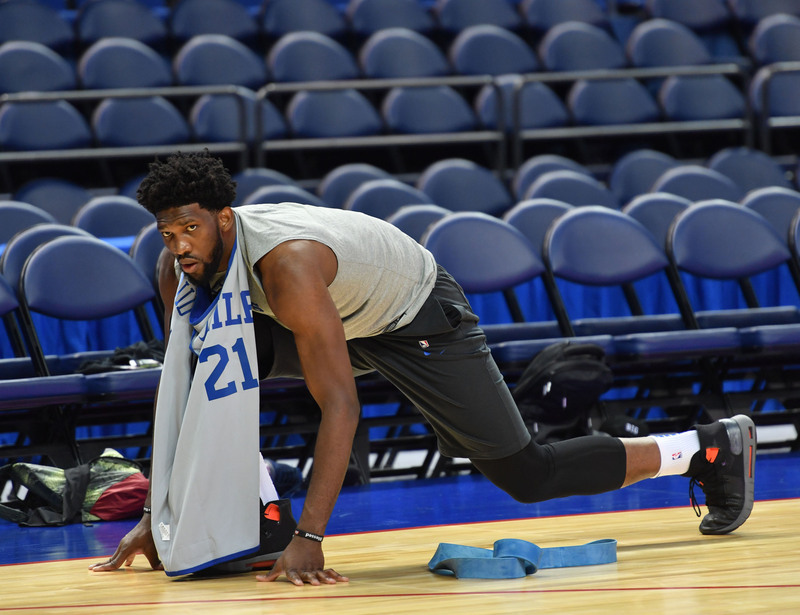 Joel Embiid is one of the NBA’s most exciting stars. He represents everything the league is about as a global ambassador, a showmen, great Internet presence and one of the most skilled big men the NBA has ever seen. Embiid’s sneaker contract with Adidas expired on Sept. 30 and he is one of the top free agents on the market. He has been spotted throughout preseason wearing Under Armour’s Hovr mid and low sneakers and wasn’t shy about how close he is to signing with the brand. Under Armour is in desperate need of a second star and Embiid will fit right in behind Stephen Curry. While he has enough personality to be the face of a brand, his injury history could hold him back from being a future signature sneaker star. Time will tell. Remember, Curry faced the same issues before leaving Nike for Under Armour. Which team has the best sneaker roster? The Lakers might take the crown for the best sneaker team in the NBA. LeBron James is No. 1 is shoe sales and the LeBron 16 is going to be another hit. Brandon Ingram is one of Adidas’s prized prospects and has already displayed great colorways of the Adidas Crazy BYW on court in preseason. Kyle Kuzma joined the Kobe lineage of ambassadors such as DeMar DeRozan, Isaiah Thomas, Devin Booker and Giannis Antetokounmpo. Lance Stephenson is a top 5 sneakerhead in the NBA and constantly wears retro Jordans. Josh Hart has worn everything from Kobe’s to PGs and you can’t forget BBB’s own, Lonzo Ball. The Rockets are not too far behind with a roster that boasts true sneakerheads P.J. Tucker, Chris Paul and Carmelo Anthony. James Harden is prepping to release his third signature sneaker with Adidas soon. 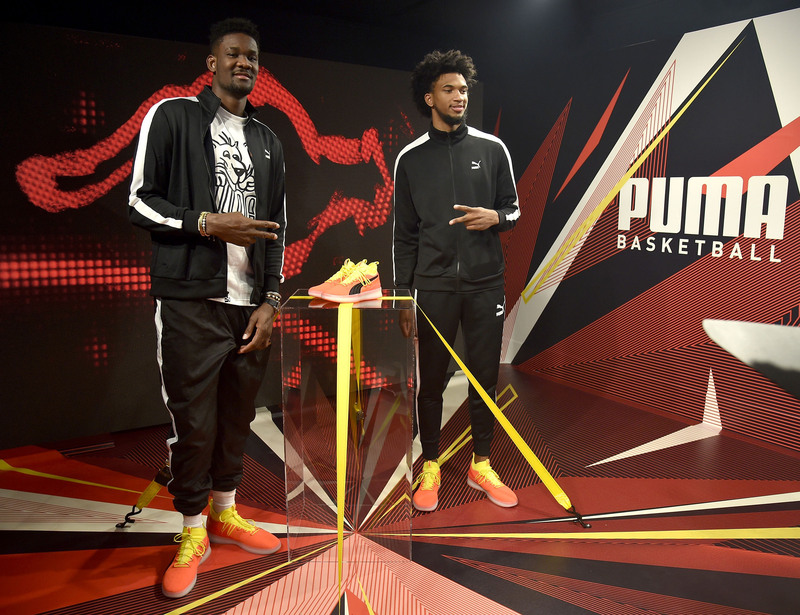 How will Puma fare in its first basketball season? To make a crack into the sneaker business you must have “your guy”. Nike had Jordan and now has LeBron. Adidas had Kobe then Derrick Rose and now has James Harden. Under Armour was more known as a football brand until Stephen Curry evolved the company into basketball relevance with back-to-back MVP seasons. Puma has bet big on the 2018 NBA draft class but does any member of their current crop have superstar potential to lead a brand? Deandre Ayton already looks like a freak of nature but doesn’t scream sneaker star. Marvin Bagley III, Michael Porter Jr. (if healthy) and Kevin Knox in New York all could breakout and be the guys but it is too early to tell. Terry Rozier will have to find a home outside of Boston if he is ever going to be Puma’s centerpiece. Maybe the brand will get lucky or maybe this whole thing does not work out but it will be fun as hell watching this throughout the season. Do rappers have the most footwear influence? It depends on which artists we are referring to here. Kanye West, Drake and Pharrell are megastars that have crazy influence in culture right now. With basketball sales on the decline, they have become the faces of the athleisure/casual trend. But that's still only three guys compared to massive basketball stars like LeBron James, Stephen Curry, Kevin Durant, Kyrie Irving and more. Basketball players have long been the gatekeepers of culture. Look at what Michael Jordan did with his sneakers during the '90s in the golden age of hip-hop. Times have definitely changed but no performers are outselling LeBron or Kyrie in the sneaker business. Which sneaker release is most anticipated? Kyrie 5: Irving, the second-leading sneaker salesman in basketball, is fresh off a brilliant campaign with the Kyrie 4. Expect the Kyrie 5 to enjoy a huge rollout after the success of the Uncle Drew movie. Kyrie’s star is shining bright as ever. PG3: While the PG2 fared well on the court, it did not receive as much glory as the PG1—a sneaker players still wear on a nightly basis. Hopefully the PG3 finds the same magic as the George’s first silhouette. Giannis 1: Antetokounmpo will have one of the most anticipated sneaker debuts in years. The Greek Freak re-signed with Nike last year after he was almost wooed away by Adidas. He told The Crossover, “I have a lot of things on the shoe that is going to be really surprising and I think we did a great job. People are going to be excited." Dame 5: Damian Lillard has solidified his star status in the sneaker community and had a great year in the Dame 4. The Dame 4 X Bape collaboration was one of the best on-court sneakers last season. Curry 6: Curry is entering a crucial sneaker year. Under Armour is in need of a major hit to keep its name afloat and on par with Nike and Adidas. Chinese apparel brands are also making a case to surpass the brand by signing major basketball stars. LeBron Watch: The LeBron Watch Program was the best sneaker story last season. The King is just getting started in L.A. Expect to see crazy colorways on the court. Air Jordan 33: The Air Jordan 33 is Jordan Brand’s boldest design in years. The laceless silhouette can be seen on the court already with guys like Victor Oladipo, Kemba Walker and Mike Conley. What the most underrated sneakers? Klay Thompson’s Anta KT4: Klay Thompson is not the first guy you think about when discussing sneakers, but you have to give him credit for keeping his name buzzing. His “China Klay” persona has elevated his brand to new heights and the Anta KT4 is not a bad-looking shoe. Spencer Dinwiddie: Shoutout to Nets point guard Spencer Dinwiddie, who started his own sneaker line after fielding zero offers from major brands. While his sneaker won’t be sold to the masses, Dinwiddie will try to wear 82 different colorways this season. My only question is this: What happens if the Nets make the playoffs?